The Bluebirds have arrived at Songbird Prairie. 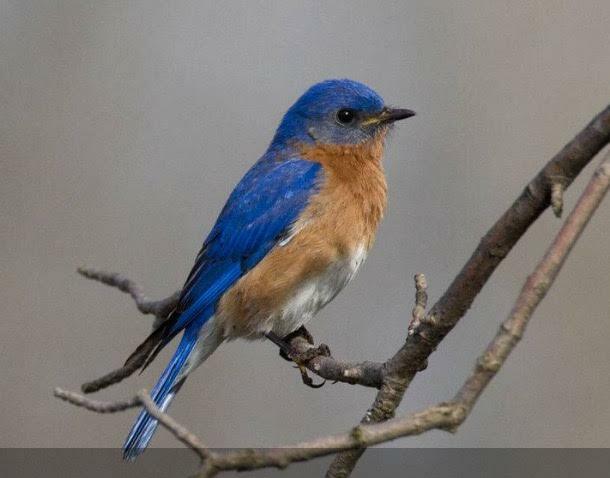 The Eastern Bluebirds' diet changes in the winter from mostly worms and insects to fruit, nuts and berries. They can eat the fruit from crab apple trees, Mountain Ash, dogwood, holly, eastern red cedar, and American elderberry. And as you found out they appreciate open water in the winter. A pond or heated birdbath can draw them in large numbers for afternoon drinks and preening. At the feeders bluebirds love to eat mealworms, fruits, nuts, and suet. They consume about four grams of food per day, about 12% of their body weight. A seed cylinder feeder with a Bug, Nuts, and Fruit cylinder along with suet nuggets in the tray may entice them to stick around a littler longer to dine after their baths.